Teak (Tectona grandis) is a native species in the rain forests of Burma, India, Laos, and Thailand, and now grows in about 40 countries throughout the tropics. Domestic uses have tamed a species of wild popularity in the nautical world. In the early 1800s, sailors and traders discovered that girdling selected trees, found deep in a Southeast Asian rainforest, allowed the timber to die and dry on the stump over a period of several years. This made logging teak much easier, as the wood was much lighter and more moveable. Still, harvesters used elephants to drag these massive logs for miles to a river. When the monsoon arrived, rain swelled the riverbanks. Teak floated downstream from the interior and landed a prominent role in the decks and trims of European and American boats. Wood hobbyists are seduced by the species’ coloring, which can run from yellow-brown hues to dark golden brown at the heartwood. Although this species of hardwood has moderate to high color variance, the heartwood turns a rich brown color when it is exposed to sunlight – a color-textured kaleidoscope of possibilities. Teak sapwood is a lighter cream color. Depending on its growing conditions, teak may have a greenish tint, small stripes of yellow and even some darker colors. Teak wood is known for its natural resistance to the elements. It has an uneven texture, straight grain, and a distinctly oily feel. With these qualities, teak is a prime pick for outdoor structures or garden furniture and for indoor cabinetry applications. Teak has been particularly useful in shipbuilding because it does not crack or turn black when in contact with metals, so it is ideal for marine use. Teak continues to be key in the boat construction industry. On land, teak has many uses from doors, window frames, and sculptures to cabinets and interior furniture, to name a few examples. Teak can also be manufactured into flooring in a variety of sizes and designs. The chemical industry recognizes many applications for teak because of its durability and resistance to harsh chemicals. Another outstanding feature of teak is its durability in all types of climate conditions. Outdoor teak furniture needs no paint or varnish as even severe winter snow storms, monsoon rains, and tropical heat cannot diminish the strength of teak. Machining: moderately easy when working with hand and machine tools. 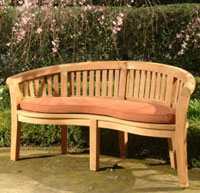 In spite of its hardness, teak rips and crosscuts more easily than oak. You must always use carbide blades when working with teak, as the silica in the wood can dull tools quickly. Finishing: finishing teak poses the most difficulty. The natural oils within can interfere with the adhesion and drying properties of some finishes. To reduce the wood’s tendency to repel finish coats, surface resins may be removed with a 100% pure solvent (not recycled) that is compatible with the finish to be used. 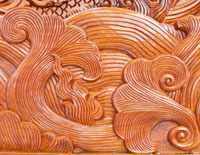 Carving: you can carve it with chisels and a mallet as the wood takes fine detail. However, the silica in the wood dull chisels quickly. Power carvers should use carbide cutting burrs when working with this wood species. Gluing: use epoxy or resorcinol adhesives. Make sure to scrub all the wood to be joined with acetone, and let it dry before gluing. Staining: doesn’t take stain exceptionally well, and traditional clear finishes (except lacquer) can be a problem. That’s why teak is frequently coated with a penetrating oil, such as tung or teak. Dimensional Stability: Excellent (5.8; 33% more stable than Northern red oak). Sanding: can clog abrasives, so frequent sandpaper changes are required. Teak is generally difficult to sand as it may dish out if screened too much with a dull screen, and the edger, digs in easily. Hardness/Janka: an average of 1000 (16% softer than Northern red oak). As with all wood species, measuring the wood’s moisture content (MC) is crucial for the optimum enjoyment and performance of the end teak wood product. Given modern technology, a wood moisture meter can be programmed to account for the unique species’ wood density. Moisture meters such as the Orion® 930 are the best means of assessing teak’s MC throughout the life of the wood product. Therefore, it is wise to view moisture meters for wood as imperative investments when working with the wood species teak. Thanks for writing such a good post specially wood and teak wood which is an important wood for carved wooden furniture. We use a lot this wood furniture manufacturing and people enjoy this wooden furniture items a lot. Nice post.